Outraged loved ones say a Brooklyn father of eight was scared to death — literally — after cops swarmed his apartment while searching for someone who slugged a woman and stole her cellphone. Carlos Alcis, 43, dropped dead Thursday from an apparent heart attack as his helpless wife and four of his children protested the fruitless intrusion in Brownsville, relatives said. Compounding the tragedy, cops asked Alcis’ 16-year-old son Emmanuel, whom they rousted out of bed and wrongly suspected of being the thief, to help perform mouth-to-mouth. The family also claimed it took nearly 30 minutes for an ambulance to reach their Rockaway Parkway home — just blocks from Brookdale University Hospital. “They scared him to death. 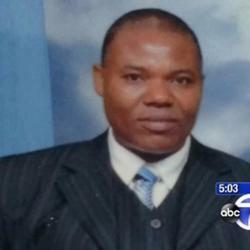 He was healthy and fine,” Alcis’ brother, Stevenson Alcis, said of the Haitian immigrant.